Our three sets of cards cover respectively your KM diagnostic needs, your cultural analysis and KM intervention design. Bundled at an attractive combination price. 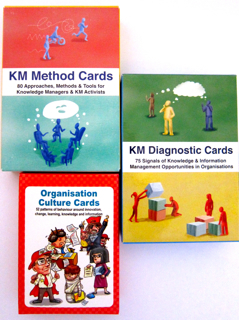 Our KM Method Cards, Organisation Culture Cards and KM Diagnostic Cards bundle is available for online purchase at USD135 (including package and posting). This is a savings of USD15 over buying them separately!